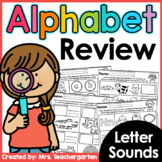 Alphabet Sorts ~8 Picture Sorts to Review Letter & Sounds~ Great Center Idea! Roll and Read - LETTERS! A funsical way to practice and review letters! Trick or Treat? 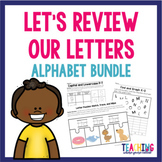 Editable Game for Reviewing Letters, Sounds, Numbers and More! This set of handwriting papers goes with the Review of letters and sounds at the beginning of the year. Each day's lesson has a page of handwriting practice for the students. One page reviews all the letter and the numbers to 10. This product accompanies my Alphabet Chant Posters and my Alphabet Chant Journal Paper. Send these pages home for parents to cut out and use as flashcards. This is a worksheet that students can color pictures, cut them out and glue the pictures in the box next to the correct letter. Students will take all that they have learned about genetics and put it into a letter to inform a new student. This takes students putting into their own words and drawing to explain how Genetics works. Students will take all that they have learned and write it into a letter or another format to explain it to the new Commissioner. Student's will be not only educating the Commissioner, but also demonstrating how to make the community more Eco Friendly. Lowercase Alphabets A-P *Directions omitted from worksheet so that you can come up with your own. I sent this letter home to go with Lucy Calkins' Persuasive Writing for 1st grade. The lesson was about "best in show". I also added a date and signed my name at the bottom.